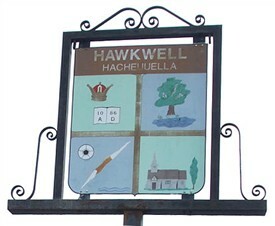 I lived in Hawkwell for the first 21 years of my life and have many happy memories of growing up there. 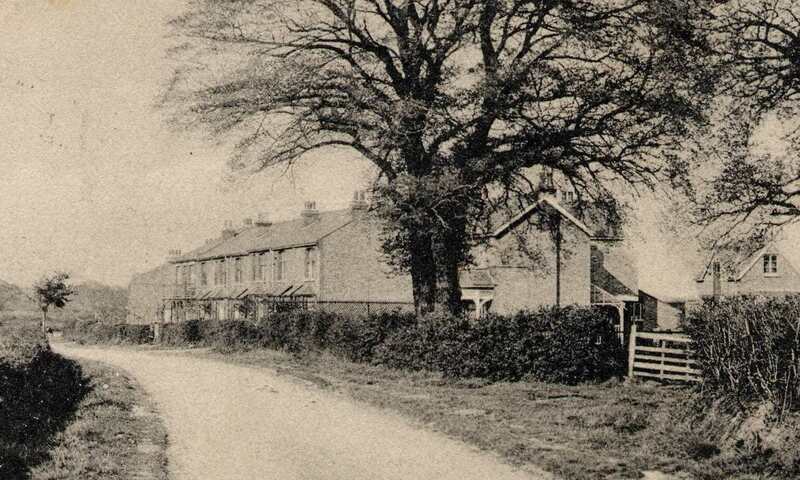 We moved to Rectory Road from Westcliff in 1940, as my parents considered the countryside a far safer place to bring up a family whilst the country was at war. We were the Hakens and I (Valerie) lived there until my marriage to Brian Smerdon in 1961. I had four brothers: Maurice, Norman, Trevor and Ken, and one sister Pat. In 1944, my brother Trevor was walking behind a tractor pulling a noisy piece of farm equipment outside our house, then ran across the road to home, straight into the path of an oncoming coal lorry. The lorry driver drove Mum and Trevor to the hospital in his own car, but Trevor died in her arms on the way. He is buried in Hawkwell churchyard. During the school holidays and weekends my playground was Gusted Hall woods, (where a large bomb crater was the most exciting place to play) the cinder track, a local short cut via Sweynes Avenue to the Hawkwell recreation ground where we fished for newts and minnows in the large natural pond in the corner of the recreation ground and talked to the children living in the Dr. Barnados home. Coming from Hockley and approaching Hawkwell, there is a road on the right leading to the sports Centre. In the furthest corner of the field was the home. A large red-bricked mansion-like house, and the children used to put their fingers through the fence to touch ours. They were the first 'black' children I saw. Our village shop, run by Florrie and Sonnie Ayres, stocked everything from pegs to paraffin, sweets to sugar and Ted Ayres ran the coal and paraffin delivery service. Opposite our house was a large field (now the Englefield Close, named after the builder) and during the war a German parachutist bailed out from his burning plane and landed in this field. My Dad (a member of the Home Guard) rescued him from his parachute and brought him indoors for a cup of tea before handing him over to the authorities. 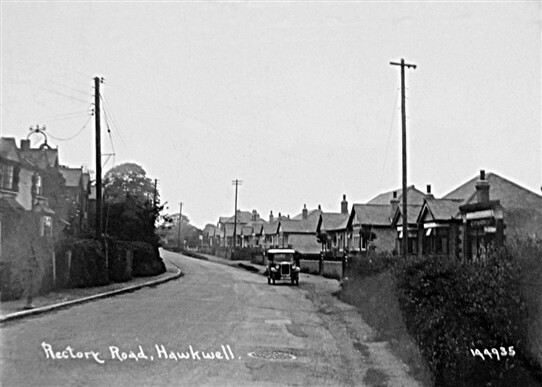 Hawkwell was home to a lot of families: the Gridleys, Abrahams, Noads, Towlers (a teacher at the secondary school), the Millingtons, Hunts, Hines, Cates, Wells, Simmonds, to mention but a few and we children all attended the Rochford Schools. On Sundays we attended the Baptist church in Rectory Road, something I dreaded as the night before my mum would wrap my hair in rags to create perfect ringlets for Sunday school, a practice which I found painful and barbaric! Driving back through Hawkwell, a few changes have been made. The house I grew up in is now two flats a row of smart bungalows grace the village and the recreation ground is now a lovely sports centre, but if I park the car and walk along the road, the memories come flooding back. Happy days! This page was added by Mave Sipple on 16/10/2012. As a child I lived in Rectory Road, I knew quite a few people in Sweyne Avenue and some people in both roads still live in the area. I will ask if they recall their names. In the mean time this may help - if you join Ancestry or Find my Past and look at the 1939 Register it will, as you can see here, give you details of John Norman Purkiss and Flora. Sometimes they have an offer to join for two weeks free. I would be interested in speaking to anyone who remembers my mum. The only information I have is from her birth certificate. Her name was Patricia Nancy Maud Purkiss, she was born in a bungalow called Bramblemere in Sweyne Avenue in 1935. Her parents were Flora & Norman and she had a brother called John. I remember my Mum telling me she attended Rochford school, and worked at Spencer’s picking tomatoes or strawberries. Since she past away in 2000 and my father recently died, I am trying to find out my mum and grandparents history. So if anyone remembers the Purkiss family I would appreciate it. Thank you. I live at 118 Rectory Rd, Glencot, an old detached cottage next to Magnolia Park. I thought it was Georgian, but have no records before 1950s, and according to the maps it only appeared in 1940s, so must be mock build, an old neighbour Mr Keys said he remembered it being built, so that takes me to 1940s again, all the other houses around seem to be of that era and linked to brickfields but this one is different and has land, does anyone know anything? Brian Smerdon, Valerie's husband, is my cousin. I lived on Hainault Ave just off Rectory Road. I was so interested in Valerie Smerdon's article re Rectory Road. I knew her family, her sister Pat was my friend whilst living there. They lived next door to my grandmother (Mrs. Baker). I lived in a flat across the road with my mother. But we spent most of our time at my grandmother's. I remember the dogfight between the two planes, I didn't know what happened to the Messerschmitt but I do remember the pilot from the British plane, presumably a Spitfire, parachuting into the field opposite my grandmother's and I joined the crowd racing across to where he landed. He suffered a broken leg and I think he was Polish. We moved back to Southend in1943 but of course visited Grandmother regularly. Whilst living there I went to Hawkwell School and then on to Rochford School. I remember Mr & Mrs Abrahams very well as one of their sons courted my sister Pat. They had one daughter who I recall was nicknamed 'Babe'. Hello. I was brought up on Rectory Road and used to go in the shop all the time. Have you any old photos of the shop? My Mum and Dad were Brian Pitman and Pat Pitman. I'd love a pic of shop and coal yard. I am sending the photo as an attachment (Note from RDCA: photo now added to end of above article). I cannot date the photo but Cliftonville Stores was owned by Mr & Mrs Ayres senior who later opened Ayres coal yard at the rear of the shop and the coal lorries used to go into the yard by the right of the shop. I can remember the gas lights there was one opposite my house as a child but that one is out of view in this photo. There was also a bus stop outside the shop and another opposite (both are still there) this photo was before that. I do not know when the bus service was introduced there was one in 1947 when I started school. The white footpath sign righthand side ofphoto was the footpath picking up the footpath to Hawkwell Village Hall or before that to Hawkwell Park Drive. I can remember the unmade footpaths. I am only guessing the photo was perhaps in the 1930s. The car may give clue but I am not an expert on cars. I'll then scan it for you and put it on the site before returning the original - please don't forget to enclose a return address. The photos of Rectory Road are really great thank you so much for sharing. I have not seen these photos before or any of this time anywhere, I wonder what other properties were in Rectory Road at this time, does anyone have any photos or dates please? I have a more recent photo of Rectory Road but appears to be prior to a bus service as there is no bus stop outside Cliftonville Stores/Ayres coal yard and no footpath either. I would like to post this photo on here can someone advise me who to send to please? 1. 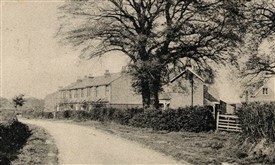 The row of houses date from between 1897 and 1922 (it was just an open field in 1897). 2. Swayne Avenue was a little later and dates between 1923 and 1938. 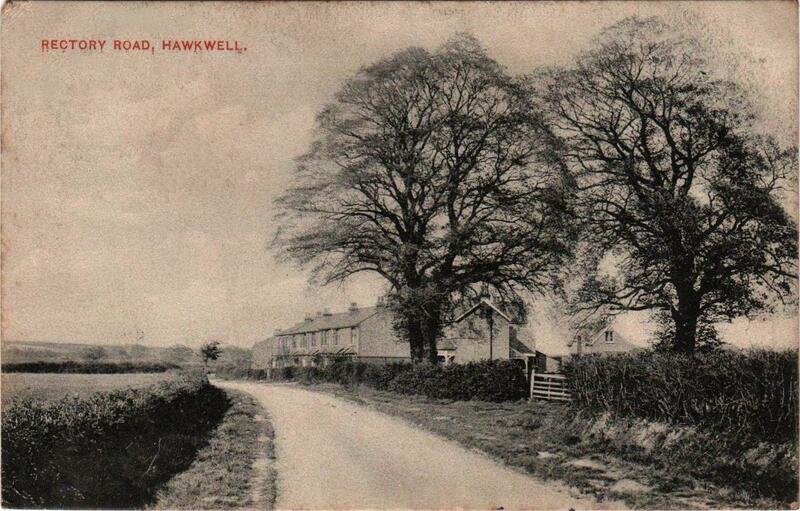 Loved the archive photos of Hawkwell. It was a great place for children to grow up in. thanks for sharing them. Valerie. Hello Jon - I've published your comment below under your pseudonym "Nathan Bell". That way you can see a list of all your contributions on the site if you click on My Pages in the top bar or on This Link (your pages are listed first and then your comments). I'll now add the photos to the above article. Note that the software doesn't allow anybody, including myself, to add photos directly to a comment since this would perhaps have a tendency for comments to morph into articles. Pain about the old-maps site. I'll see what I can do about existing links to it on the site in the New Year. The card view is of Rectory Road, Hawkwell looking towards the church with the terrace properties opposite Sweyne Avenue. The card was posted in Hockley in November 1905 by a Mrs Hughes to her daughter in Leyton. So this was well before the bungalows and other housing were built but I am sure that Val and the contributors will recognise the view - the close up may help. I would have added the pictures to the article myself but don’t think I can do that using the Comment facility. Oh yes a shame about Old Maps. I use the site regularly but can’t zoom in to see street names clearly now, even on city maps. I remember the Hunt family well as Mrs Hunt was kind enough to look after my brother Ken and I when the funeral of my brother took place. She gave us both a plum to eat and after we had eaten them I didn't know what to do with the pips, so I put them into a vase of flowers in her lounge!!! I blush now at the thought but I was only 4 at the time. Just a quick comment. Valerie together with my brother Peter Hunt and parents lived opposite you and your family in Rectory Road. I recall all that you have written growing up as a child in Rectory Road. Denise, I remember your mum Doreen and her brothers when they lived in Sweyne Avenue and how Mrs Abrahams could often be seen walking from her home in Rectory Road with a covered plate down Sweyne Avenue with something she had cooked for your mum, brothers and sisters. Just reading this and had to comment. My mum was one of the Gridleys you mention above, Doreen Gridley and I remember Mrs Abrahams she looked after my mum and her brothers and sister when they lost their dad. My mum lived in Sweyne Ave when she was a girl then to Rectory Road where I was born.